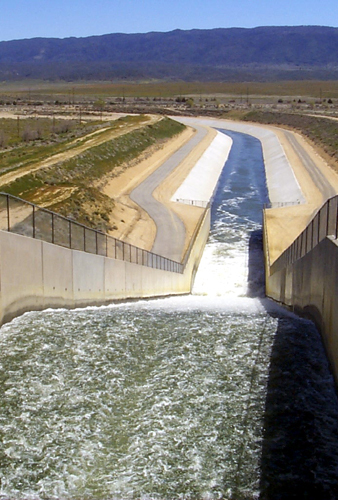 Aspen prepared an EIR for the California Department of Water Resources (DWR) for a project to construct and operate a storage reservoir (afterbay) on the East Branch of the California Aqueduct in the western Mojave Desert. The Tehachapi East Afterbay provides 1,159 acre-feet of additional operational storage that allows downstream facilities on the East Branch and, to a lesser extent, the West Branch to operate for short periods without relying on the pumping operations of the Valley String Pumping Plants. The project reduces pumping during peak electrical demand periods and provides increased operational flexibility. With the project, pumping has been shifted from expensive, peak periods of power demand to off-peak periods when power rates are lower, resulting in cost savings and the statewide benefit of more efficient and stable energy consumption. The project is located at the foothills of the Tehachapi Mountains where water exits the Porter Tunnel after being pumped over the mountains from the Central Valley to the western Mojave Desert. The EIR focused on the construction impacts of the proposed project, particularly short-term effects on air quality and sensitive wildlife species in the area. To support the EIR and project permitting, Aspen managed a series of biological and cultural resource surveys of the project site. These included a biological reconnaissance survey, complete cultural resource survey, and wetland delineation of the project site and potential borrow sites, totaling over 300 acres. During project design, DWR decided to relocate the project site to the east side of East Branch due to geologic constraints at the original project site. The new site, while superior from a geologic standpoint, supported more sensitive biological resources. Aspen conducted new biological and cultural resource surveys for the site, including surveys for the coast horned lizard and burrowing owls. Aspen also assisted DWR with pre-construction compliance with mitigation measures, including bird surveys and clearance surveys for coast horned lizards. In addition, Aspen provided the specifications for post-construction revegetation efforts and helped DWR prepare a Habitat Enhancement Plan as mitigation for habitat impacts.